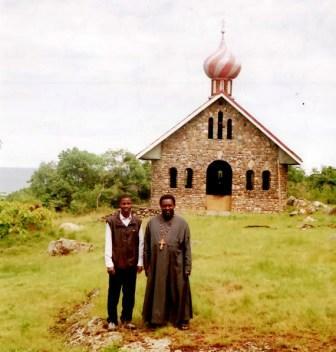 Fr Christopher Walusimbi, Bukasa Island, Uganda. "In December of 2012 was my third trip to visit Fr. Chris and his mission. It is one of the most of humbling and rewarding experience of my life. Bukasa Island is located on the northern Edge of Lake Victoria. Just South of the equator. To reach the island, one must take local wooden boats, that can take anywhere form 4-8 hours, across the equator. The island is sparsely populated by fishermen and subsistence farmers. Very little infrastructure exists there: Rainwater is collected for cooking, drinking and cleaning. All cooking is done over coal fires, and the only electricity available comes from those who have generators. Everyone, however, has a cell phone. Cellular technology is the only real way to stay in touch, and do business in this part of the world, and it is fascinating to be surrounded by natural beauty, no noise from cars, or people, yet have your pocket buzzing from a smartphone. Father Chris is well known and respected there. 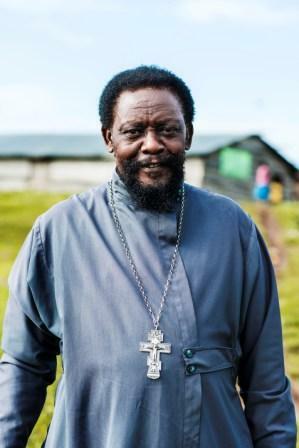 He is not only a priest, but also a representative to the District educational Committee, a Board member at two other school committees; he is also considered somewhat of an elder in the community and is a popular person to consult with in any family crisis. Fr Christopher is almost 70, but he’s just as active as he has always been: he is still helping orphans in the Sesse islands, who lost their parents during one of the many AIDS epidemics here, For the past 25 years he has also run an ambulance service form the island to the mainland 40 miles to the north. Besides serving every Saturday and Sunday, hearing confession whenever any of his parishioners need it, and taking care of his parish and other duties, Fr. Christopher has to take care of his own large family, he has a wife and ten children. The services are held in a wooden chapel decorated with donated icons. Somehow the termites that populate and devastate the homes and villages on the island have not touched this small chapel. For over 25 years Fr Chris has been building a Russian-style church. All materials (except for the coupla) come from the area. Sand from the lake is used to make cement, the entire church is made from stones found around the island, termite mounds are broken, dried and then use for coal and incense. The church is nearly completed, yet he has run out of funds to complete it. He has many of the materials needed to complete the doors, windows, floor and the alter, but he needs the funds to pay for the workers. He has a large family to take care of, medical expenses often add up quickly: malaria, typhoid fever, and even the common cold or flu can be devastating. His family help pay for children’s education, and they do not have the culture of receiving lines of credit for post secondary education are we do. Fr Christopher entertains visitors. A.Pomnikow (far left). Life is hard, but Fr Chris and his family do what they can for their community. 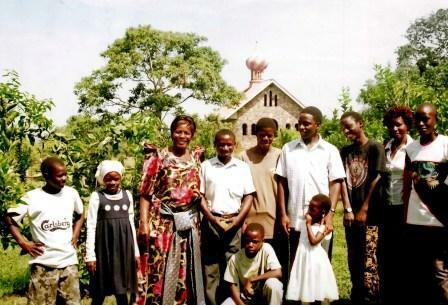 They have adopted many children who have been orphaned by the Aids epidemic in the 80s. They own a tractor (sponsored by the FFA – ed.) that has helped in the construction of almost all major structures d roads on the island. They also own a boat that ferries people to and from the island(sponsored by the FFA – ed.). This boat has recently caught a lot of attention because it is the first one to has cushions and a bathroom onboard. Until recently, the only way to get around the island was on foot. In the last few years, motorcycles have been brought to the island, and it is now possible to get around much faster – Matushka Maria was the first to purchase and import one to the island (sponsored by the FFA – ed.). Bukasa is very much off the beaten path for most travelers, and so they don’t see many foreigners, yet they accept everyone with open arms. Many people, and especially children, are curious about white people, some have never seen white skin before and run away in horror. I have learned a lot form my time with Father Chris. Father Chris is one of the most amazing people I’ve ever met. He is always in good spirits and loves to laugh. He welcomes all those that come to him, will give you anything you ask, but will never ask for anything in return. It’s not easy being orthodox on Bukasa Island, but Fr Chris does everything in his power to enlarge the mission. Bukasa Island feels like the perfect place for a mission. It is so peaceful and tranquil, that prayer comes easily without the distractions of the modern world. This church could be more than a place of worship, but the spiritual heart of the Sesse islands. 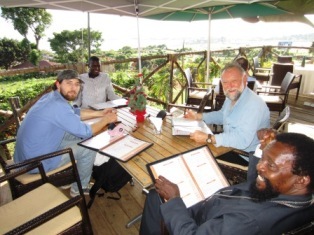 A place where not only Ugandans, but all Orthodox come to pray and find spirituality." 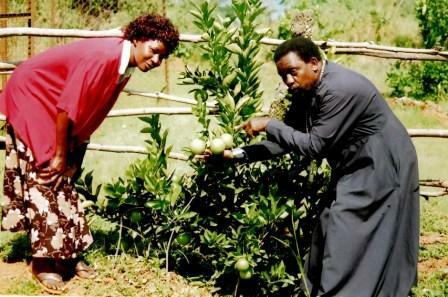 Fr Christopher and matushka Maria in front of one of the mission's orange trees. The mission grows oranges for sale. In front of the half-completed church. Fr Christopher with some of his parishioners. Take a pilgrimage to Uganda from the comfort of your home!